El Gauncho Sano is the only Argentinean restaurant in Vilnius and a true meat lovers’ dream. 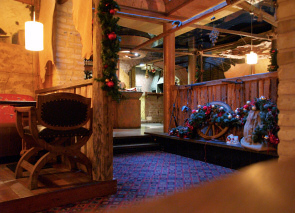 The restaurant can be easily found right on the main street in Vilnius Old Town inside Atrium hotel. A lonely gaucho (which means shepherd in Spanish) sitting outside the restaurant will signal the way. 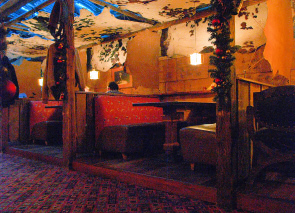 When you step inside it’s hard not to like its exotic deco: brown and black spotted cowhides draped on the walls and ceiling, ornate wooden furniture, photographs reflecting the past and Argentinean music playing - all set to create the atmosphere of a little Argentinean village. 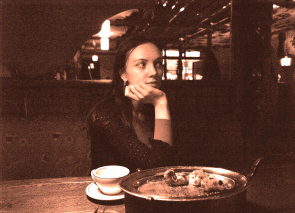 I loved the dim lighting, warm shades and the fireplace, which creates a homely warmth and makes it very cosy to dine. The Argentinean chef, who specially came to Lithuania, ensures the authentic taste of Argentinean meals made according to the traditions of his country. The menu here hits on different kinds of beef, veal, pork, lamb and chicken dishes alongside Argentinean starters and salads. I selected Grilled pork loin nuggets (Broqueta de cerdo) 10 €, served with very tasty spicy potatoes and El Gaucho Salad. Combined with a special sauce the flavours worked excellently. The meat was cooked with an exquisite balance of tender inside and crisp outside. The people behind the grill here obviously know how to char a piece of meat beautifully. My food was delivered on a special carving board with live coals placed under a metal dish to keep the meal hot. The menu offers a very wide range of wines from the main regions of the world. Lija went straight for a desert called by an exotic Panqueque de dulce de leche“ name - Argentinean pancakes with chocolate sauce inside 3 €. On Wednesday and Thursday, you can listen to live piano or guitar music and on Friday and Saturday well-known Lithuanian performers are playing. 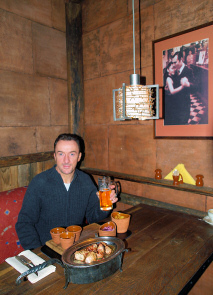 The equally outstanding atmosphere and high quality food makes this restaurant in Vilnius really worth visiting.